The Q-Chord has a great sound and it's very easy to play. 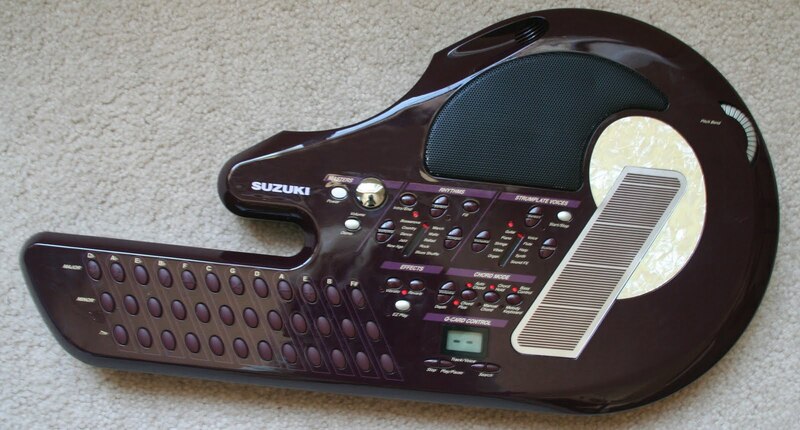 To play a song, you press the appropriate chord button and then strum a finger across the metal plate. These tasks can be shared - one person can press the chords while the other strums or visa versa. 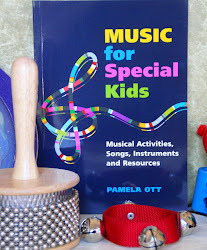 The Q-Chord has a variety of different voices and accompaniments and is tons of fun to explore. 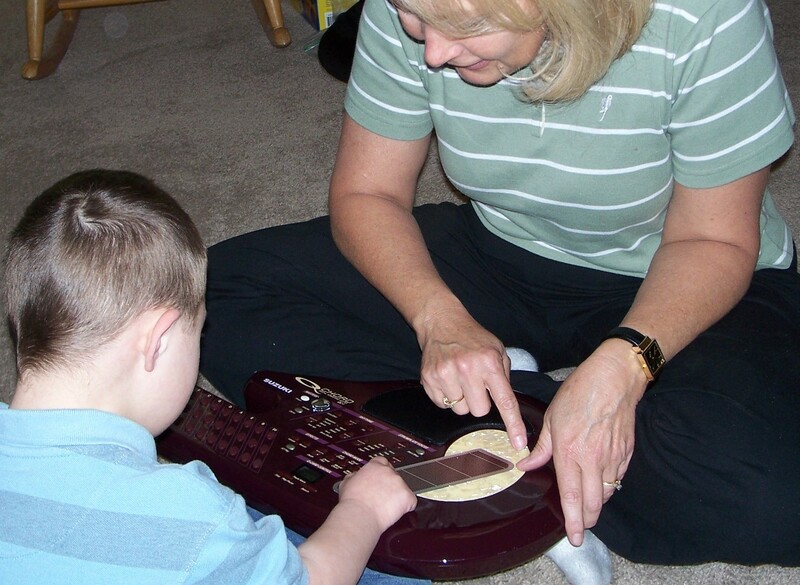 I use the Q-Chord to stimulate interaction, increase coordination, stimulate gross and fine motor skills and increase self expression. 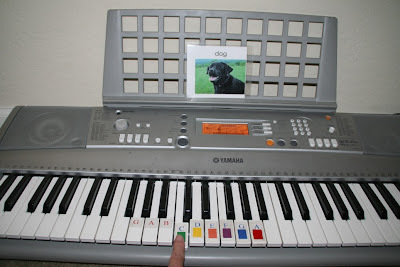 Most keyboards have a setting with sound effects or instrument sounds. My keyboard (see post on January 18) happens to have a setting that includes animal sounds and other common everyday sounds. 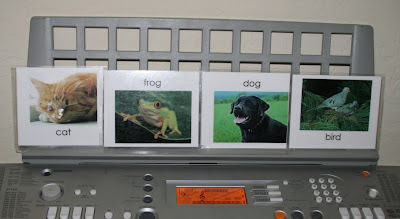 I made 3 X 5 cards with pictures of the animals (can you tell I like to use a lot of visual cues with my children?) and begin by putting one card on the keyboard. I usually demonstrate where the match to the picture can be found, then ask the child to press the appropriate key. Depending on the child, I normally present 2-5 cards per session. If they have difficulty remembering where the matching key is, I encourage them to find a "keyboard clue". Is it on the C, the red key, the highest key on the keyboard? Once the child has mastered finding one sound, we move to two, then three and four and attempt to find the sound in the order presented on the cards. Eventually, many of the children I work with enjoy setting up their own order of cards on the keyboard. For children that have difficulty following the order of cards, I encourage pointing to each card before playing the match on the keyboard. Many children could probably identify the sounds of different instruments on the keyboard too. I think the key is making sure you can stay on the same setting or voice for each set of cards. 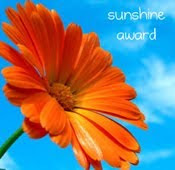 This activity has also been beneficial when working with children with noise sensitivities. 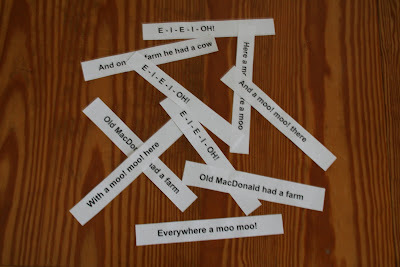 One child I worked with had difficulty hearing the cow sound on the keyboard. After playing this game for a while, she was able to hear the sound if I turned the volume down, and eventually she would pick the card on her own and listen to it at full volume! 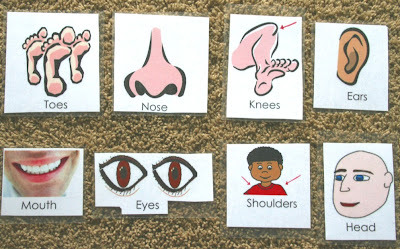 An fun activity that I have used with good results involves the well known song, "Head, Shoulders, Knees and Toes." 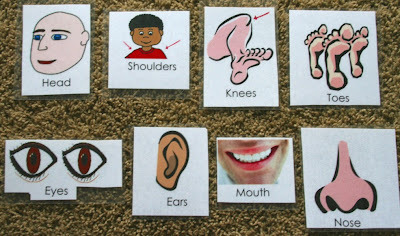 I printed pictures of all of the body parts named in the song, cut them out and laminated them. I then set them out in the order they are sung. We first sing the song while I point to the corresponding card. Then, I mix the cards out and set them up in a different order. We sing the song again, this time tying to use the new order of parts. 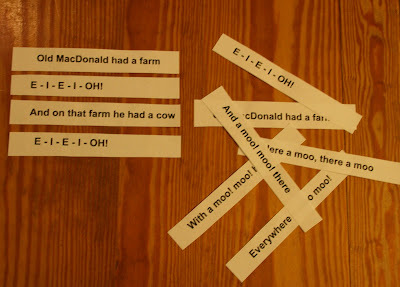 Initially I will point to the cards as we sing, but eventually we try to point to the corresponding part on our body. Usually, the children I work with want to pick an order of their own! 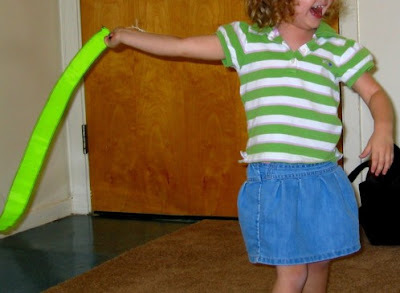 This activity is great for children who have difficulty taking things "out of order" and frequently the activity is fun enough for them to "try" a different order. 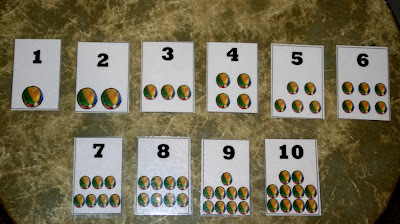 It is also great for practicing "taking turns" while putting the cards in a new order. I'd have to say the overall favorite instrument of the children I have worked with is the gathering drum. Unfortunately this has been the least favorite instrument of the adults in close proximity to my office! 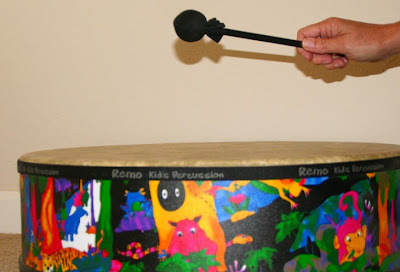 The gathering drum has a warm reveberating tone that absolutely draws children in and makes them want to hit it again and again - so obviously one skill we work on with the drum is impulse control! The following exercise requires impulse control and encourages number recognition and the connection between the visual number and the harder concept - "number sense". I made a set of number cards - each number on its own 3 X 5 card. On each card, the number had the corresponding amount of balls. I place the numbers on the gathering drum and tell the child I am working with that we will get to play the drum upon completion of this "game". Begin by practicing counting 1 - 10 while pointing to the number on each card. Then pick a card - I usually start at the beginning with 1. Tell the child you are going to hit the drum 1 time. 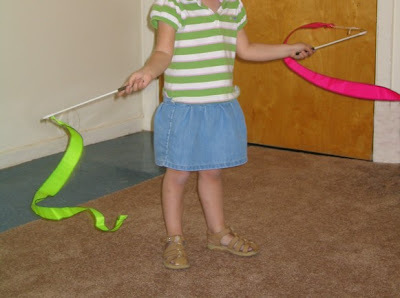 Encourage the child to also play the drum 1 time and point to the ball on the card as they do. Once they are able to hit the drum just one time, go to the 2 card. Count to two while pointing to the balls. Ask the child to do the same. 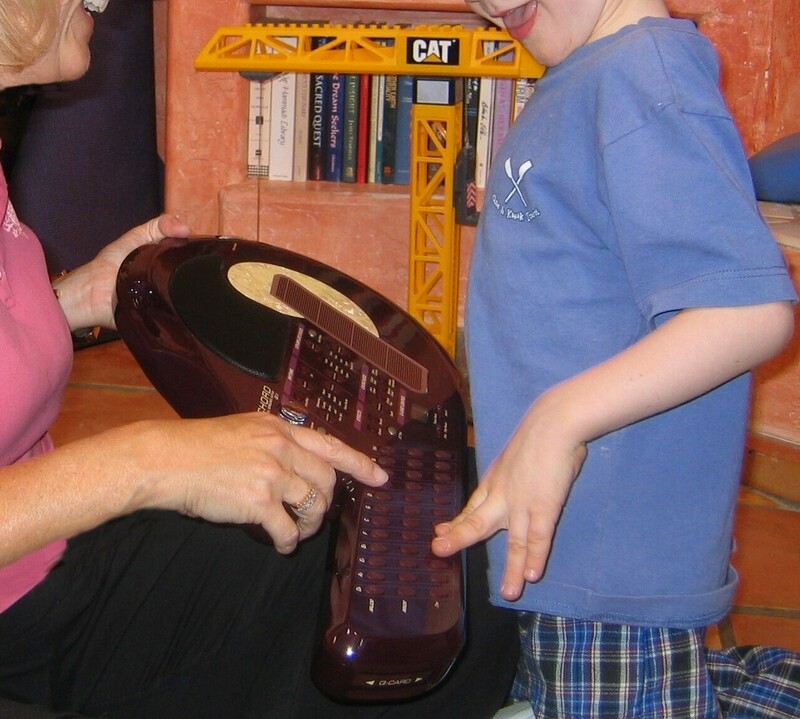 Then once again tell the child you are going to hit the drum 2 times. Ask them to do the same. 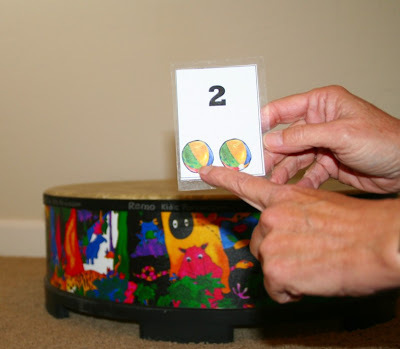 Repeat with each of the cards until the child is able to hit the drum the correct number of times on the drum. At the end of the exercise, reward them by letting them play spontaneously with their hands - and play along too if they will let you! Once the child has mastered this exercise, you can shuffle the cards, have them pick a card and play the corresponding number on the drum. As a final step, once the above exercises have been mastered, I will encourage the child to do this activity with one mallet. This adds an additional level of impulse control, so be sure they have the first steps mastered before handing over the mallet!